MaD is a registered charity/NGO assisting communities in areas such as water, sanitation, housing, sustainable agriculture, healthcare, and education. MaD aims to empower communities with the knowledge and resources they need to build a sustainable future free from poverty. Ren explains his fears when taking on an assignment in Cambodia, and his realisation that all volunteers can add value. Why did you decide to volunteer with AfID? I saw an AfID advert in a magazine and as I had just arranged a career break, I thought volunteering would offer a change from just travelling place-to-place, give me something productive to do, and a chance to see the local way of life. I decided to go through AfID as that made me feel more comfortable that I wasn't inadvertently depriving someone local of paid work. Also knowing that the partner organisation wouldn't receive a financial incentive for my placement was important in ensuring I was there for the right reasons. You chose to work at MaD in Cambodia, what was so appealing about the organisation and the nature of the placement? What was it like being the first AfID volunteer at MaD? It was a case of narrowing down what was possible. Placements were available in Africa, India and Cambodia. I had just left India, and I wasn't going to Africa, which left Cambodia. Siem Reap has plenty to see, restaurants / bars and good transport links. MaD is partnered with a rural community - Prolit - about 50km from Siem Reap. They help provide medical support, sanitation facilities and child welfare assistance. Delivering such basic needs support to a rural community where the average wage is about $1 / day felt about as useful as it could get. I also appreciated the emphasis that MaD placed on working in partnership with the local people and its experience with their own volunteer programme. It has taken MaD time and effort to build a trusting relationship with Prolit and this gave me confidence that they weren't some cowboy outfit which might end up doing more harm than good. A lot of volunteers worry whether they have the correct skills to add value. Was this a concern? This was my biggest worry. Coming from a UK corporate tax practice, I couldn't think of anything less useful to a Cambodian rural development NGO. However, as Neil said, just being there and coming from a different background was helpful. I began to understand my placement as just a small piece in the overall development of the team, and by sharing my experiences with them, and the issues they encounter with me, the benefit was mutual. Seeing the placement from that viewpoint helped alleviate my concerns about why I was there. Nevertheless, I think it's true to say that volunteers with experience in advising smaller organisations will have more to offer than specialists but I also think most volunteers will have something to add - even if it's just a second opinion on how things get done. A little common sense goes a long way - that was my experience at least. 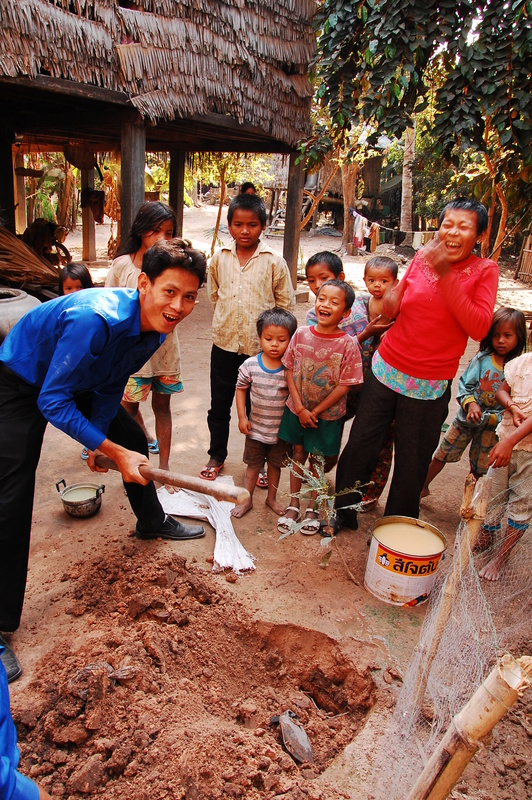 Did you find it challenging adapting to local life in Cambodia? It was pretty much as I expected. This wasn't my first time in Cambodia so I sort of knew what to expect and the volunteer accommodation at MaD caters for western tastes. However there were plenty of surprises. For instance, the largely irreverent attitude held by taxi drivers to drinking before driving; resulting in a few dubious rides through the darkness on the back of a moto piloted by a tipsy Cambodian, without a crash helmet. However, the only traffic accident involved an entirely sober tuk-tuk driver who drove us into a ditch by a rice paddy field in broad daylight. Or perhaps that the Khmer for: cheers - 'chul moi' - was on first hearing indistinguishably close to 'joi moi' which loosely translates as an obscene (and anatomically improbable) act. In true Khmer fashion, this was enough of a signal for the whole team to go into hysterics as I butchered their language. On the whole the Khmer people are about the friendliest I've met. It's an over-used phrase but it's very refreshing coming from London where people are far more reserved. In the end, that had a far bigger impact on how quickly I settled than any material luxuries. I’m sure a day’s work at MaD is significantly different to a day’s work at Deloitte in the UK. Can you outline the main differences? I'm not sure even where to start. I suppose the main thing is that doing anything at all takes at least twice as long as a very, very conservative estimate. MaD only has a part-time trainee accountant so Phil asked me to make my own suggestions. Unlike at the office, where more senior resource is available to give advice, and division-making is a more rigorous process, I had to identify what I thought was achievable and what was appropriate. I also found that paper files and office furniture are subject to the vicissitudes of the Cambodian climate which includes rain, heat, termites, mice, insects, and some more rain. In fact, recent flooding has rendered Prolit inaccessible by road and MaD have launched an appeal for urgent funds for a boat to help deliver food (www.facebook.com/madcambodia). I went down to Prolit about once a week to say hello to everyone and play ball games with the kids. Within an hour, they were using me as a mobile climbing frame and various children had run off to play with my sunglasses/camera/phone. This obviously does not (regularly) feature in my daily routine at the office. Did the Director Phil appreciate you being there? What about the rest of the staff – were they welcoming? You would have to ask Phil but he said so to me. I think he was just glad to have someone from outside come and take a look at what they were doing, and to give Makara a little support. As the founder he had many other obligations and very little time so he said anything I could do to help was appreciated. The staff were very welcoming (although their enthusiasm in entreating volunteers to neck half cans of beer, after-hours, is sadly not matched by their stamina). The only hiccup was initially communicating to Makare that I was there to help and not to report on her performance. After we talked this out, she opened up and relaxed. I would say this was critical in developing a productive relationship. You were at MaD for just three weeks; do you feel you made a difference in that time? I was at MaD for six weeks which was long enough to do something but it felt that just as I had learnt enough to get going it was almost time to leave. I was the first volunteer so my task was to assess what systems and processes they used, document this to help future volunteers get going, and make suggestions as appropriate - this included starting an asset register and helping Makara take responsibility for reporting income/donations. Do you think that you adopted a new set of skills – personal and/or technical – whilst on your placement? I got a more holistic feel for the reporting and control issues facing a small NGO. My work is usually limited to multinational clients so the experience of seeing daily activities (payments, fund-raising etc.) first-hand and how they are recorded and controlled was new to me. I think the more transferrable skills relate to communication, coaching and taking initiative. I began to realise just how difficult it can be to manage even small changes. There's no point to parachuting in, changing things, and leaving for everything to revert to as it was before. I had to give a lot of thought to how my suggestions might be practically integrated into their working practices. Did you manage to do sightseeing and a bit of travelling whilst on placement? Yes, AfID put me in touch with another volunteer in Phnom Penh and I went down to see the capital for a weekend and then he came up to Siem Reap to see the Angkor Temples. The weekends were my own and Phil was flexible in terms of moving a day here and there to suit travel arrangements. He also kindly arranged a trip for me to see the floating village at Kampong Plok and if he was going into town I'd hitch a lift. Absolutely. Just from a purely personal perspective, volunteering puts you in contact with local people who can show you things that a tour guide won't. It makes for a far more individual, and therefore rewarding, travel experience. Would you recommend volunteering to other accountants? Yes, but I also think having a little experience of visiting developing countries makes it easier to adapt - or at least being a little less fussy. I tried to keep an open mind and a focus on what was realistically achievable. How well I achieved this is another matter but I think we both benefitted from the placement.